These are the Yoast SEO Review 2019. Yoast SEO gets rave reviews because of its great content optimization features as well as its keyword optimization features which may help you in driving traffic. Look, if it is the matter of driving higher traffic, then there are numerous ways to drive more and more traffic to your website. We have many times heard about Google search console to be one of the reasons to generate higher traffic to your website etc. Yoast SEO is one of them. 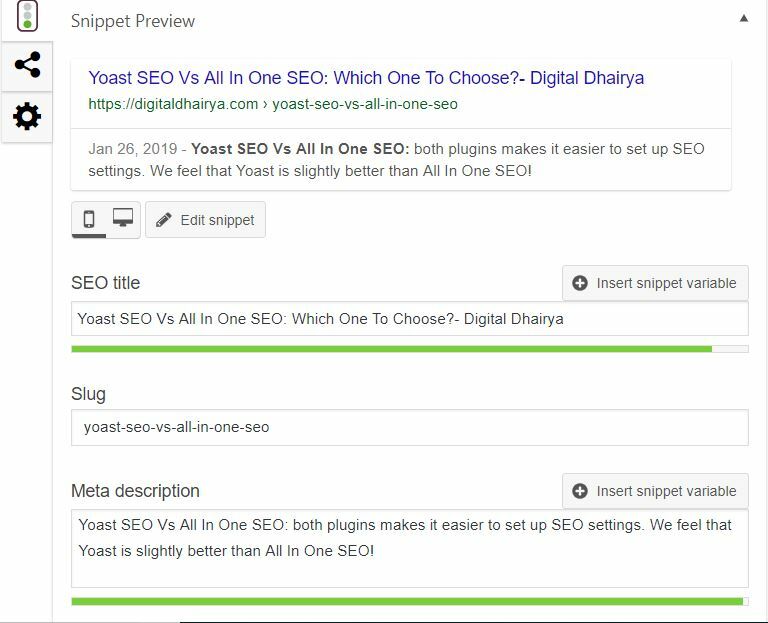 I gave this popular plugin a thorough test and came out with the Yoast SEO Review 2019. This will help you understand why to choose and why not to choose this SEO plugin. Start using Yoast SEO, if you are keen on optimizing your content properly in order to increase your search ranking. With Yoast SEO you get a solid toolset that certainly helps you to aim to be No. 1 spot in the search results. 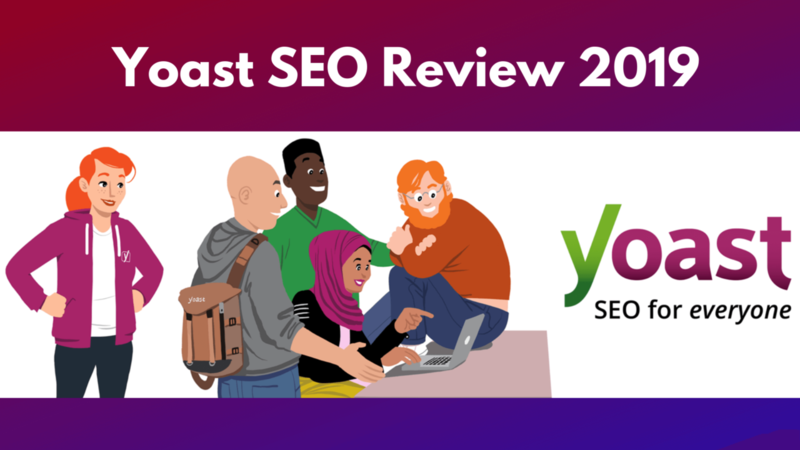 Yoast: SEO for everyone, read out why it is so popular and why do we need the Yoast SEO Review 2019. The main reason is to find out if it is a right plugin for you. In our latest article Yoast SEO Vs All In One SEO, we have featured both the SEO plugins. Let’s have a look at the pros and cons first in the Yoast SEO Review 2019. We are starting with the superpowers. Yoast SEO excels at SEO tech and a back-end which makes super freaking easy. It helps your website with some of the tools. Yoast makes this easy for you to edit the page titles and meta description tags. Meta tags are key to your SEO strategy for each and every page. This will also help you in ranking high on search engines. 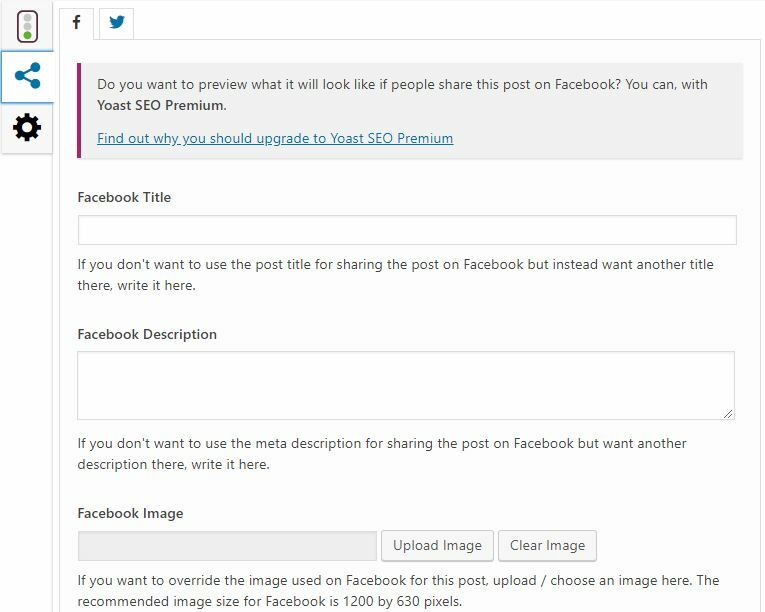 You might have noticed that whenever you post a link of your content on Facebook, it shows your page title, snippet tags as well as your featured image on it. It sometimes happens that you may not like to use your featured image on Facebook. Rather you would like to set a graphic for Facebook only. So, you can easily do this while using Yoast. You can also do the same thing with Twitter as well. This feature makes it easy for you to check how many internal links have appeared on each post. Yoast adds an internal links column to the “All Posts” and “All Pages”, tables in your dashboard. It is very likely that you are not using these as of now. Yoast SEO has given this feature for some of the important features. Maybe we do not know the importance of this feature, but this helps in promoting the content on search engines. Just like any other so-called “perfect” individual, Yoast SEO has some limitations. This is the reason why we have come up with Yoast SEO Review 2019. Despite several benefits that Yoast is providing, there are disadvantages of using it. It is not able to control the structure of your website. The website remains insecure. The threat of security is there. [Note: Here we are talking about the Yoast SEO as a whole. This includes both versions of Yoast SEO i.e., Free version as well as the Premium version]. 3. Is Yoast SEO Easy To Install? WordPress SEO by Yoast started Yoast SEO in the year 2010, though the plugin was originally rooted in the year 2008. The developers of WordPress used to say that WordPress will be able to provide a great platform for SEO and Yoast can fill in some of the gaps. Yoast is considered a powerful tool that consists of a wide variety of functions. Yoast SEO is a very simple WordPress SEO Plugin to use. This free plugin is easily available in the directory of the WordPress Plugin. All you need to do is, go to the WordPress dashboard and click on Plugins. A drop-down menu will appear, from this choose “Add New”. You will be guided to the “Add Plugins” page and in the search box provided to you please fill it by typing “Yoast SEO”. 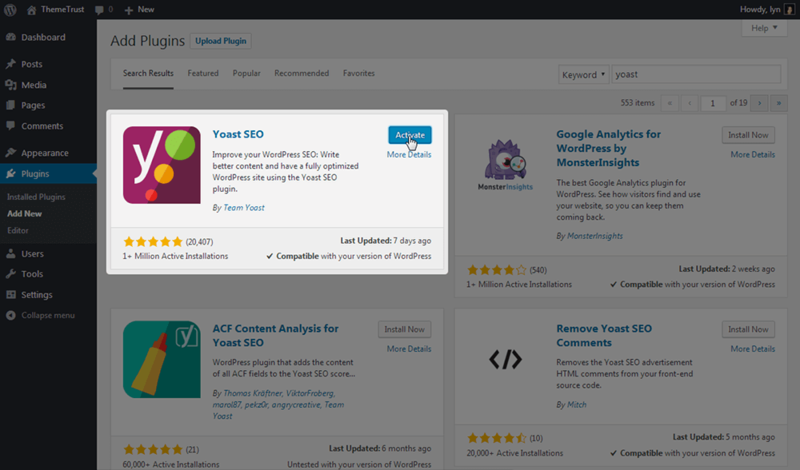 As shown in the picture above, the Yoast SEO plugin will appear with an installing button. You have to click on “Install Now”. As soon as your plugin is installed, an activate button will appear. You have to click on “Activate”. Your Yoast SEO plugin is installed and activated now. You can now take the advantage of all the features and functions provided. So, you just have to follow what the WordPress will make you do and rest will be done itself. Once you have installed and activated it, your work is over. 4. Is Yoast SEO Easy To Use? Yoast SEO is very simple and easy to use. Yoast SEO is available in 17 different languages of the world and it has been downloaded a whopping 25 million times. These are the reasons why Yoast SEO is considered to be the most popular and most downloaded WordPress plugins ever. Still, we are in need of Yoast SEO Review 2019. Once you have activated Yoast SEO, you are ready to use it, whenever you will start with your On-page SEO. When you scroll down to the page, you will find the Yoast SEO tab. Under the Snippet Review tab, you have to fill in the spaces provided. By filling these spaces you will be able to get an appropriate SEO Title. This will give an identity to your blog post on the search engines like Google, Bing etc. The next space you have to fill is Slug. You have to fill in the focus keyword in the slug area. Make sure your slug does not contain any stop words. 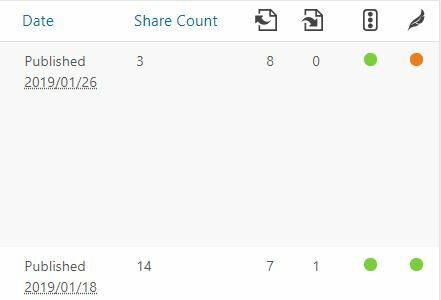 You have to remember the analysis is based on the number of times your focus keyword has appeared on the blog post, the internal links as well as the outbound links etc. 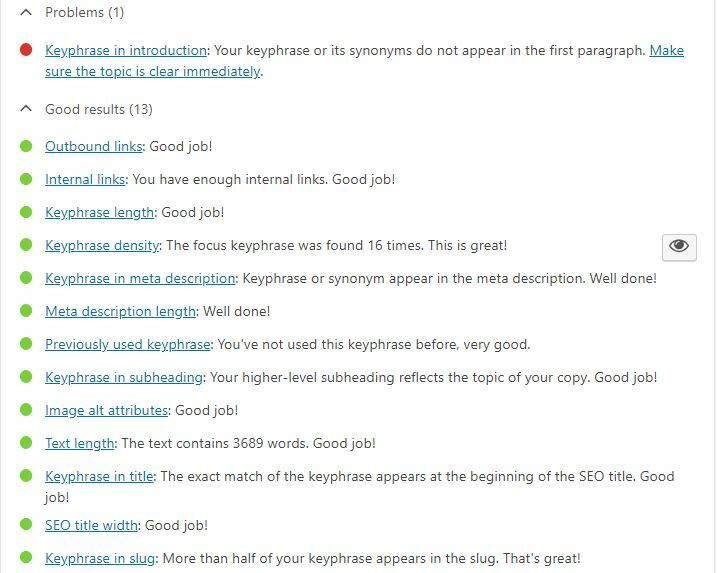 You can add related keyphrases only with Yoast SEO Premium. This is a paid and upgraded version of Yoast SEO. 5. How Good Is Yoast SEO pricing and Support Options? Well, Yoast SEO is already installed on millions of website all over the world currently. It is the plugin that you can use freely without needing to buy any premium version of it. The drawback of the free plugin is that it does not come with support. The reason behind this is that it will be difficult to answer the support queries from all over the world. Hundreds and thousands of users send queries from all over the world. We have been saying this again and again that Yoast SEO is one of the most downloaded WordPress plugins. This says that you can easily find tutorials as well as extensive documentation for the Yoast SEO plugin by the users all over the world. Yoast SEO WordPress plugin provides on-screen instructions for each and every feature inside the admin area. The SEO concepts, as well as the Features, are also explained on the website of the author. All this does not suggest that support is not available. You can also purchase a website’s licence in a very nominal amount of say $89(ex VAT) per year or maybe less. In fact, the premium version of this WordPress plugin also gives you access to some of the additional features as well as the premium support. 6. What Are Features And Benefits Of Yoast SEO Premium? Let’s enlist here all the features as well as benefits we are going to get if we take subscribe for Yoast SEO premium. Yoast SEO Premium has many extra features, which includes one-on-one email support, for those people who have bought a premium only. Just like this, let’s take a look at the features and benefits of buying a premium plan. In a free plugin, you can optimize for a keyword, keyphrases and synonyms, related keywords and all word forms. In Yoast SEO Premium, it takes you to a major step further. There will be a check not only for the keywords or keyphrase that you have entered but it will analyze your text also on all variations of that phrase or word. For example: if the keyphrase is “apartment decorating ideas” and the synonym is “room decorating ideas”, then all the word forms of each word will be taken into account. In this way, your text will be truly optimized. You may have noticed that in the free version you can set only 1 focus keyword or keyphrase. This means you have to choose only the one to optimize for. When I talk about Yoast SEO premium, you have the option to add more and more related keywords. It means when you are optimizing for ink, you can also optimize for a pen as well as for a paper. This way you will be able to reach a larger audience using the Yoast SEO premium. So, Not only your ranking will be higher but also your morale! I have talked about internal linking earlier also. Internal linking is very important as it helps the search engines to understand your website’s structure better. Yoast SEO premium is providing with the feature of Internal Linking. This feature not only analyzes your text but also suggests links to the posts related to the ones you are writing. 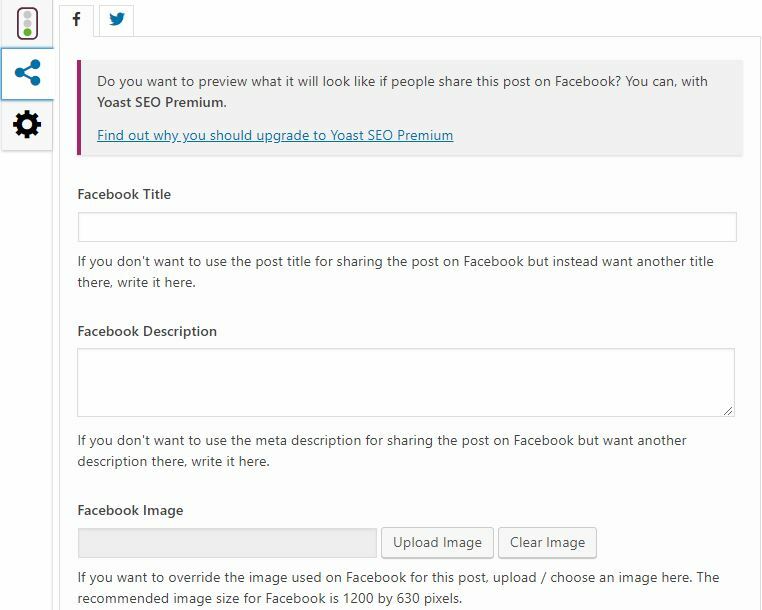 In the free version of Yoast SEO WordPress plugin, you are able to see the page preview only in Google. Now check out what your page looks like if you share it on Facebook or Twitter. Do the image is matching or the title fits into it? If you want the people to click, your social media shares should look different and compelling. 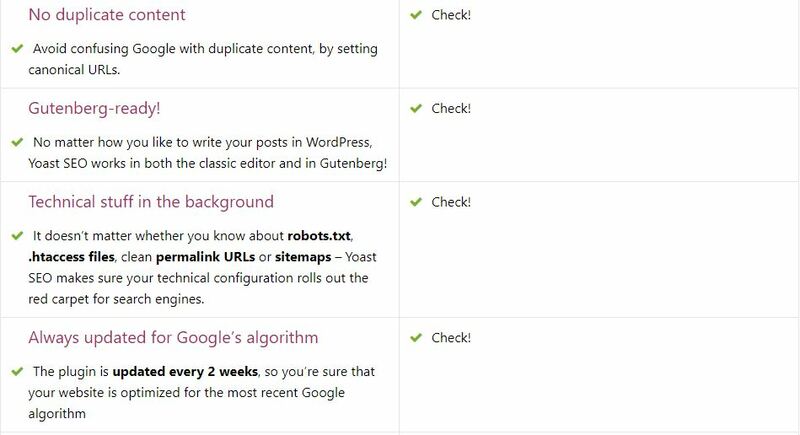 If in case you don’t want to make it more attractive for every page, then the Yoast SEO plugin gives you the opportunity to set a template for all types of pages. 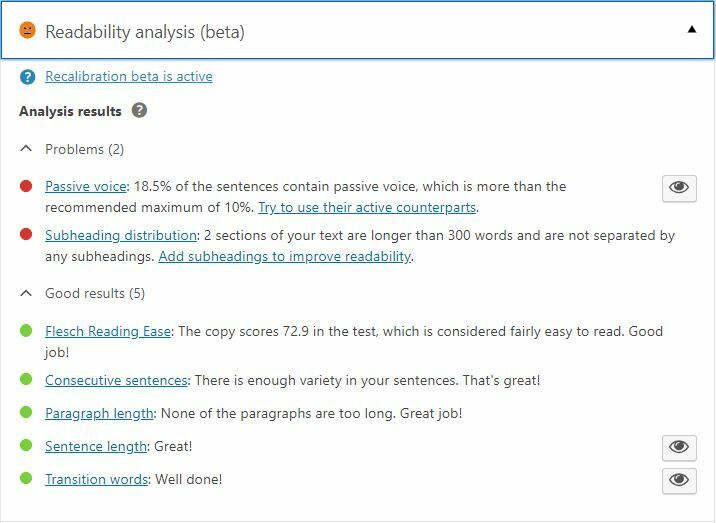 In content analysis, our insights functionality lists almost 5 words or word combinations. These words or word combinations are those that appear the maximum number of times on your page. In this way, you will be able to analyze or check if the topics or the keywords you wanted to rank on the search engines like Google, Bing, and Yahoo etc are in contrast with what you are writing about. Please remember you can do this in premium version only, in the free version you have to do the content analysis yourself. At some point in time, we all have to delete the pages. When we delete the pages and the users visit that old URL, then they found that a 404- Not Found Page. Well, in order to avoid this you can redirect them to a new page which will provide them with relevant information. Redirection is important in order to keep your website healthy. The process is very easy and needs no hustle and bustle. 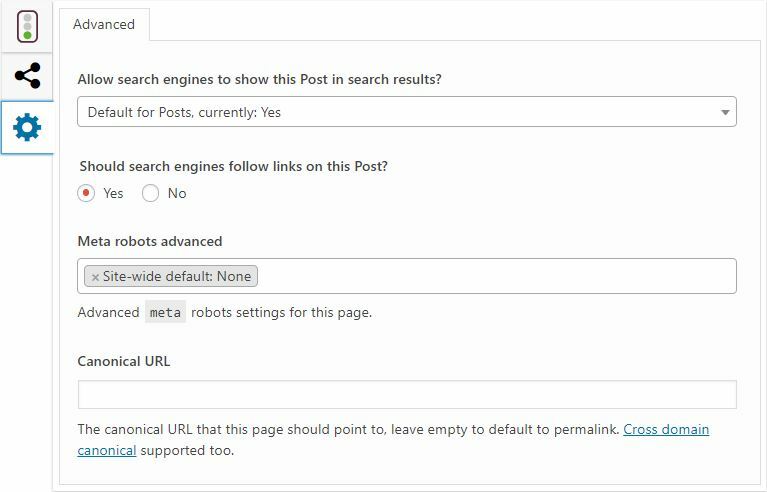 The Redirect Manager in the Yoast SEO premium version, allows you to redirect the pages, immediately after deleting a post or page. The plugin will ask you what to do with the old URL. 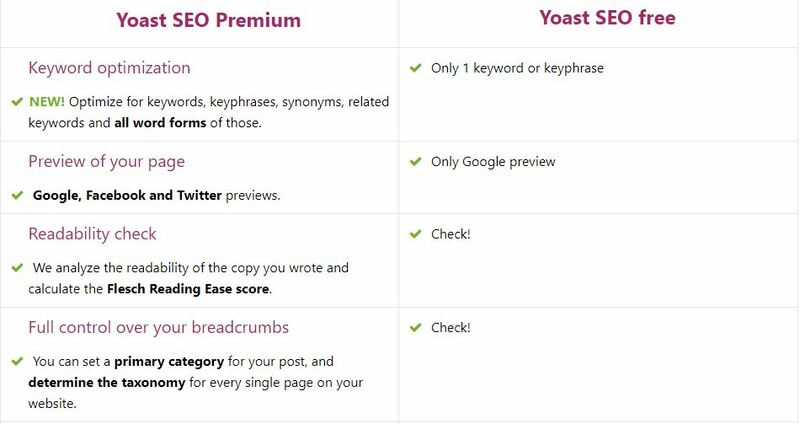 Well, with the Yoast SEO premium version, you are able to download an overview of all the focus keywords you have used and of all the pages which needs to be taken care of from the SEO point of view. You can choose the data you would like to see. This data may consist of- keywords, readability score, URL or title. Now, you can download your overview as a CSV file. This also works for content as well with multiple keywords. 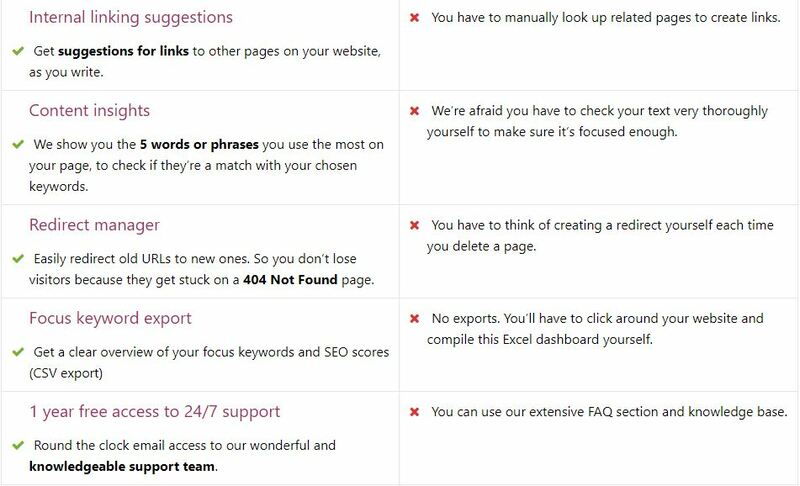 When you upgrade to the Yoast SEO premium version, it gives you full year access to get the support from the knowledgeable support team. Yoast SEO premium used to be called as WordPress SEO by Yoast Premium. You are able to e-mail them your queries related to the use and set up of a plugin and they will assist you accordingly. Well, you are not bound only for a 1-year subscription; instead, you are free to renew your subscription for getting the 24X7 support. On each renewal, you will get another year of subscription. The moment you will install the Yoast SEO premium plugin, you will notice that the ads which used to annoy you no longer exists. 7. What is the difference between the Yoast SEO Free and Yoast SEO Premium? Yoast SEO premium provides with some extra features which will make the on-page SEO and easy task for you. As in the free version of Yoast SEO plugin everything is done manually, on the other side the premium version put you on ease. In this article about Yoast SEO Review, we are talking about both the versions of Yoast SEO. So let’s look at the comparison between them. 8. What are the other WordPress SEO Plugins? There is a huge list of WordPress SEO plugins. Once you are used to the features of Yoast SEO WordPress plugin, you will definitely say goodbye to these SEO plugins. 9. Can the Yoast SEO Plugin be used in WordPress.com websites? The answer to the question is articulate. Yes, you can use Yoast SEO plugin for WordPress.com website. Digitaldhairya.com is a .com website and I am using Yoast SEO as my SEO plugin and taking advantage of all the features provided. 10. Yoast SEO Review Summary- Is Yoast SEO The Right Plugin For You? After giving it a thorough test, at least I can confidently say that Yoast SEO is the best plugin for you right now. It is simple, relatively easy to use, so you will not feel overwhelmed. Well, while comparing with another amazing WordPress SEO plugin “All In One SEO Pack”, a part of Semper Plugins’ we have found that Yoast SEO is weighing down. Despite, All In One SEO outweighs Yoast SEO, once you are used to the free version and the premium version, it will become a breeze for you. It offers you all the features that you might get on installing other numerous SEO plugins, which I have listed above. Yoast SEO is just like a packet full of features. On subscribing the premium version you will be at ease. The up gradation of the version will not only boost the ranking on the search engines but also boost your morale as well. Gives you 24X7 support from the knowledgeable support team. Yoast SEO Review 2019, is a detailed guide about both the versions of Yoast SEO. I really hope the Yoast SEO Review 2019 will help you in choosing the right WordPress SEO plugin for your website. If you have any queries related to the Yoast SEO Review 2019, you can fill the FORM here. You can also write to us at digitaldhairya@gmail.com. [Please Note: We do not entertain queries on mail. You have to fill the FORM and leave your query or comment].